IBM Researcher Kyung Ryu presented a private cloud RC2 at LISA 2010 conference. As a typical IBM project, the presentation has 20+ co-authors. The following is based on my notes taken from the session, therefore may contain my misunderstandings. Having an internal cloud is not a big deal these days. You can find several products from the market. What is truly unique and challenging for RC2 is that it supports very different virtualization platforms from X86 based hypervisors on X-series servers, to IBM PowerVM on P-series, to the mainframe based native virtualization on Z-series. Therefore RC2 is really a hybrid private cloud. Last week I attended a great talk by Google Fellow Jeffrey Dean at Stanford University. Jeff talked about his first hand experience on building software systems at Google since 1999 and lessons learned. The following summary is solely based on my notes, therefore may contain my misunderstandings. During the past 10 years or so, the scale of the Google infrastructure has grown exponentially: # docs 1,000X; #query, 1,000X; per doc index, 3X; update rate from months to seconds, 50,000X; query latency, 5X; computer and computing powers, 1,000X. The underlying infrastructure has experienced 7 major revisions in the last 11 years. Decomposition and Challenges in Parallel Programming: Is It Useful for Cloud Computing? Functional decomposition. It’s one of the most common ways to achieve parallel execution. Using this approach, individual tasks are catalogued. If two of them can run concurrently, they are scheduled to do so by the developer. Producer/Consumer. It’s a form of functional decomposition in which one thread’s output is the input to a second. Can be hard to avoid, but frequently detrimental to performance. Data decomposition, a.k.a. “data level parallelism.” It breaks down tasks by the data they work on, rather than by nature of the task. Programs that are broken down via data decomposition generally have many threads performing the same work, just on different data items. To make the three forms easy to understand, the authors used gardening as analogy where the threads map to gardners. For exmaple, the fuctional decomposition in gardening is to have one gardner to move the lawn and the other to weed. I find this analogy very intuitive and easy to follow. Even you don’t know multh-threading, you can guess it out from the gardening analogy. This 4th and last part contains best practice No.7 ~ 10. To be notified for future posts, feel free to subscribe to this feed, and follow me at Twitter. vApp is a new addition to vSphere. It’s essentially a group of VMs that work together as a solution. You can manage them as a basic unit like a VM. It provides you higher level granularity for resource allocation and management. This is an ideal container for your application if you have multiple virtual machines involved. They may or may not form a cluster, but are bundled together for a same goal. The vApps are not only easily managed by the vSphere, but also imported and export as a bundle. Therefore you can easily move it without worrying what should be included while copying it. VMware provides tools like VMware Studio using which you can create and configure vApps easily. The VMware Studio has Web based console, customization and build engine, build process automation with CLI (command line interface). This 3rd part contains best practice No.4 ~ 6. To be notified for the rest, feel free to subscribe to this feed, and follow me at Twitter. Most time, people think scalability is to handle more workload when needed. This is true, but not enough. A truly scalable system should scale back. This is how you will save money. This is equally important as the first case where you get more revenue by serving more traffic. Up and down. This is unique in virtualized environment in which you adjust the memory or CPU allocation and use more or less of them instantly. Out & in. This means you include more machines either physical or virtual into your application. This second part contains best practice No.1 ~ 3. Modern software development is all about leverage. You don’t want to build everything from bottom up. Whatever “giant shoulders” you can leverage, you should do so. Remember the keyword here is “giant shoulders.” You got to be selective on what is “a giant” and what is not, for the best quality of your system. Your application’s quality is a function of that of the systems underneath it. The typical “giant shoulders” includes middleware, high level programming languages, tools. By leveraging these, you should expect your applications portable, and with much less code and higher developer productivity. The portability is very important when you want to deploy your applications in federated cloud environment. I posted a short article after the cloud demo in VMworld 2009 keynotes. It’s reposted at SpringSource blog. The article introduced “DIY PaaS” concept which you could have a higher level of development platform inside your enterprise in a similar way as would you get from vendors like Google, but without vendor lock-in. The “DIY PaaS” does not require you to use any specific platforms, middleware or framework. You could use any existing combination of systems on top of Java, .Net, Python, PHP. For example, you could use Java with Spring framework for building your web applications or enterprise integration frameworks. The choice is really yours, not of any vendors. When making a decision, you want to consider various factors like your team’s expertise and preference, total cost of software licenses, design constraints posted by for example existing investments on particular software. Having decided the combination of software stack, you want to pack them into virtual machine templates that can be re-used by various teams. If you have multiple combinations, you can have multiple virtual machine templates in your catalog. In general, you want as few templates as possible. Why? Having less VM templates means less effort to build them, to manage, to upgrade, and to test. This might not seem like a big deal but could become a big deal in a longer term when you have to maintain multiple versions of these templates at the same time. It also means less storage. vSphere has a special technology called linked clone. The new virtual machine doesn’t fully clone the disks, but links back to the template. If you have least templates, you can have a huge saving on the disk space. High quality storage can be very expensive. Last but not least benefit is less memory. vSphere has memory page sharing technology which keeps one copy of same page contents, and converts others as pointers to the single copy. It’s only possible when you have identical memory pages. When you have virtual machines cloned from a same templates, the chance of identical memory pages increases dramatically. In my previous blog, I talked about the object model of the vSphere API. 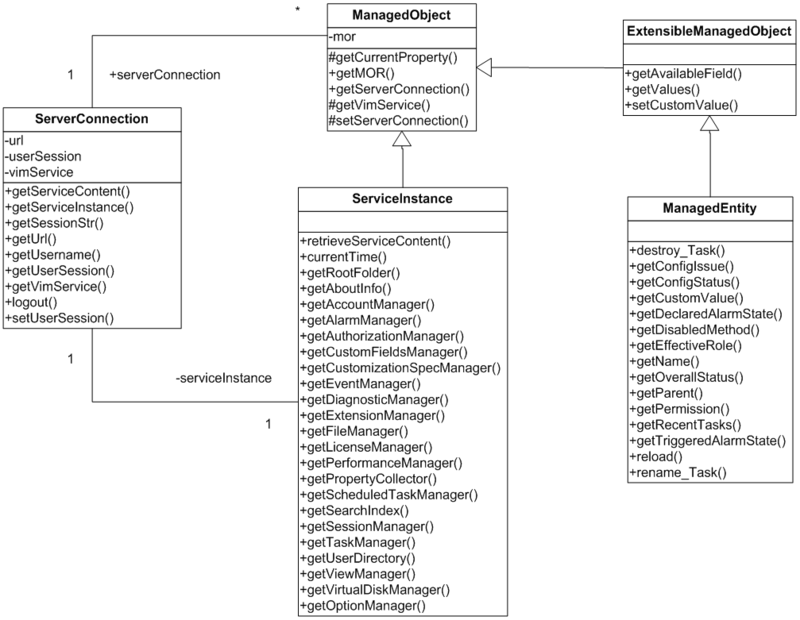 Many people like the UML diagram that illustrates how the managed objects are inherited from each other. Following that blog, I will introduce the object model of the open source Java API that is built on top of the Web Services, as well as some key design decisions I made while designing the API. I mentioned the vSphere API self paced lab at PEX in my previous blog. Not all the people who are interested in learning the API made it to PEX last month. A reader asked me when it can be online in his comment. Here is the VI Java API part in the tutorial. We had the environment set up all together for you in the PEX lab including the Eclipse and all the related jar files. So it’s very easy to get started there. Without going to PEX, you need to do something extra by yourself. But that is not too hard at all. I promise it won’t take you much time at all. To get the basic one done, you probably need 5 to 30 minutes depending on your familiarity with Java. “But, they seem nothing to do with software!” You say. You are right. But remember the blog title has a keyword “top.” If you want to stand out in any profession, some of the extra skills may well be outside your typical set as others expect. The same is true for software profession. I assume you already know the basics of software programming, process, design patterns, etc., so another programming book doesn’t help you much to the top technically.